2-3 tbsp. Butter, room temp. Move an oven rack into the middle of the oven then preheat oven to 425F. Take a cake-cooling rack and cover it in foil. Take a sheet pan and cover it in foil too! Remove chicken from fridge about 20-30 minutes prior to roasting. Make sure you have removed the innards from the chicken if there are any (sometimes the neck etc are placed in a plastic bag and put in the cavity of the chicken). Use your finger to gently separate the skin of the breast from the flesh of the breast- try not to tear! Gently rub butter under skin of breasts- this will keep the breasts nice and juicy. Stuff the cavity with whole sprigs of thyme, lemon, and the whole cloves of garlic. Coat the chicken with oil and liberally season with salt and pepper. This will give you your nice crispy skin! Place the bird, breast side up, in the preheated oven. About halfway through cooking rotate the sheet pan 180 degrees. Roast the bird until the internal temperature of the flesh reaches 165F on the breast. When you are testing the internal temperature, you should always put the probe into the thickest part of the breast- it will take the longest to cook! Skin should be golden brown. If the skin it starts to become too dark and the bird is not done roasting, tent the breast with aluminum foil. Remove from the oven and let rest for 15-20 minutes covered with foil before carving. 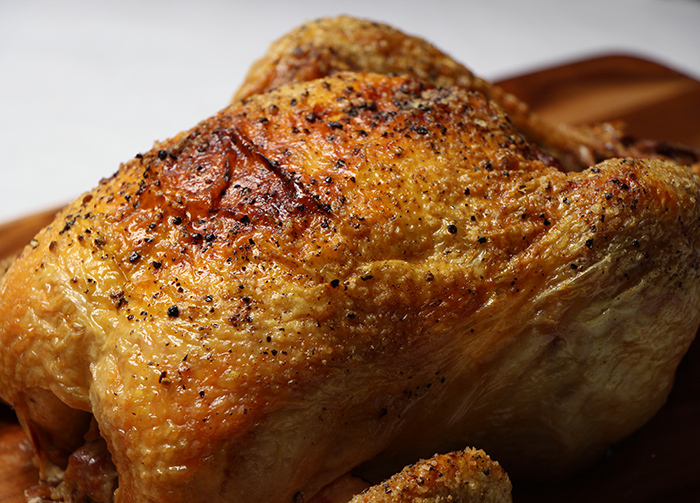 See ‘Cooking School’ for roasting a chicken, and carving a chicken instructions or video.